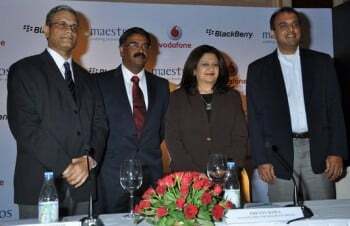 India’s leading GSM mobile service operator Vodafone Essar and Research in Motion (RIM) today launched a mobile ECG (electrocardiogram) application dubbed as eUNO R10 for BlackBerry smartphones in association with Maestros Mediline Systems Ltd in Mumbai. The BlackBerry application eUNO R10 allows the user to access patient’s ECG and heart performance reports on their BlackBerry phones.It will send the relevant information to the medial records server, which then automatically pushes the ECG report to a Doctor’s BlackBerry smartphone over the Vodafone mobile network; this will allow cardiologists to have remote access in real time to patient’s ECG and heart performance reports, and respond quickly with a diagnosis. The Nanavati Hospital of Mumbai is the first hospital in India to adopt the eUNO R 10 application. Speaking on the launch of eUNO R10 in India, Dr. Pavan Kumar, Head of Telemedicine Department, Nanavati Hospital, “A heart attack is a life-threatening event. Knowing the symptoms of heart attack and seeking immediate medical attention is essential to prevent death, while appropriate treatment instituted within the first hour the golden hour can limit the damage to the heart. Mr. Kumar Ramanathan, CMO, Vodafone Essar stated, “The launch of the mobile ECG solution is a reflection of our commitment and ability to automate high-end work processes so that organizations and people stay connected wherever they are, whenever they want. 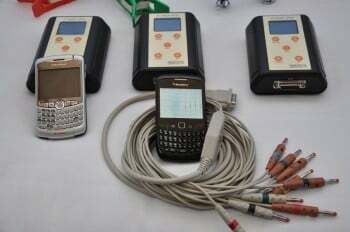 Transmitting ECG through telephone was available earlier also. Now getting it on a Blackberry mobile phone only and that also only through Vodafone makes it look like more of Commerce and less of Medicine. Such techniques are costly and most of the Indians will not be able to afford it. Thanks to Metro-centric mentality of India and rampant corruption, thousands of people suffer silently for lack of medical assistance. Technology is the only hope !